Did you know we are one of the least expensive boarding facilities in the area? But that doesn't mean we scrimp on amenities. In fact, check out our list of suite, run, and cage packages below to see why it's more affordable than ever to treat your pet to a luxurious stay in our Rowlett Pet Hotel. Unlike those noisy big-box pet grooming mills that "churn out" dozens of grooms per day with little regard for your pet's experience, an AHR groom will treat your pet to a soothing, spa-like environment. We have only one groomer which means your pet will see the same stylist on every visit. How's that for a custom cut? When you board your pet with AHR, you can rest assured your friend will be treated like royalty in a medical environment staffed by veterinarians who are trained experts at animal care and comfort. Who knows how your pet feels staying at one of those loud metal facilities with hundreds of other barking dogs. How loud it is for your pet in a big metal building during a thunderstorm? How your pet might feel when they are bullied by other dogs during playtime? What happens if your pet gets sick and there is no veterinarian on staff at the facility? If your pet really wants a huge cage to run around in or if that would be scary to them? We keep close track of your pet during its stay. Our staff carefully monitors elimination habits, appetite and overall well-being seven days a week. And of course, we provide plenty of attention on a daily basis. All pets are fed premium Royal Canin diets. If your pet requires special dietary needs, please inform our receptionist at the time of check-in. Every patient at our clinic receives an annual physical exam with a veterinarian to check teeth, eyes, ears, lung sounds, heart sounds, check for any lumps/bumps, etc. This also maintains a current doctor/client/patient relationship and allows our clinic to continue prescribing any necessary medications (such as monthly heartworm prevention) throughout the year. A new client visit is typically scheduled for 60 minutes to allow you plenty of time to meet our staff and doctors and have all questions and concerns you may have. Your first puppy visit will be an extensive learning experience! We want to give you all the tools needed to care for your new furry family member. First puppy visits will allow plenty of time for you to ask questions and make sure you have all the information you need to raise a happy, healthy puppy. 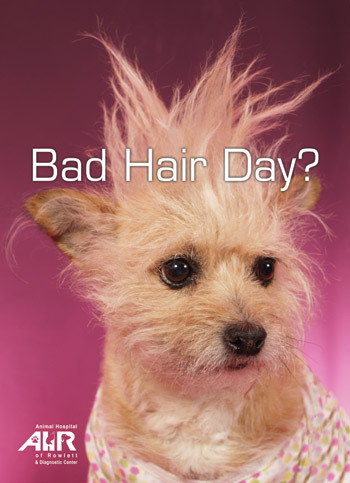 Don’t Let Your Pet be Embarrassed by an Unruly ‘do. Instead, spoil your dog or cat with a treatment in Animal Hospital of Rowlett’s luxurious Pet Spa & Beauty Boutique where we turn even the messiest companions into pampered pets. With 26 years of dog and cat grooming experience, our pet groomer, Kerri Jones knows how to treat your pet to paradise. And with our new super-quick turnaround for dogs, you can drop your pooch off in the morning and by noon she’ll come out looking like the Diva she truly is. We are so doggone excited to announce our new Rowlett Doggie Playcare program! Does your dog give you big puppy-dog eyes every time you leave the house? Do you feel guilty leaving your precious pup alone for hours at a time? Do you have to kennel your canine companion? Don’t you wish you could come home to a calm puppy after a long day at work? If you answered yes to any of these questions, Rowlett Doggie Playcare may be the answer for you! Playcare will consist of supervised play times with both structured play and social time. We have toys, a swimming pool, agility tires, and more! We will have dedicated splash days, birthday celebrations, and doggie ice cream when it’s hot! All Doggie Playcare staff has been trained one on one by our certified trainer and groups will be limited to dogs who play similarly. You can follow your dogs’ adventures on our clinic Instagram @ahrdvm. Our pet groomer is currently accepting daytime appointments. Animal Hospital of Rowlett offers professional pet grooming Monday through Friday. Your pet will be kept in a safe, friendly atmosphere and never exposed to unvaccinated animals. We require all grooming pets to be vaccinated for your pet’s safety. Every grooming includes bath, clip, and nail trim. If your pet has a medical concern you can request that it be examined by one of our doctors while at the hospital.